Fees associated with filing industrial design applications in Brazil, as well as other design fees, are available in the fee calculator. The term for filing an industrial design application in Brazil claiming priority is six months from the priority date. The minimum requirements for obtainment of the filing date are drawings of design and information regarding the applicant(s) and inventor(s). Multiple design applications are not possible in Brazil. The signed original of the POA form may be submitted to the Brazilian Patent Office within 60 days from filing of the design application. A certified copy of the priority document along with its Portuguese translation must be submitted to the Brazil patent office within 90 days from filing. If the applicant of the Brazilian design application is not the author of the industrial design, it is advisable to file an Inventor's Authorization. It may be submitted after filing of the application, official legalisation or notarization is not required. The substantive examination is not an obligatory stage of industrial design registration in Brazil. The patent may be issued based on results of the formal examination. 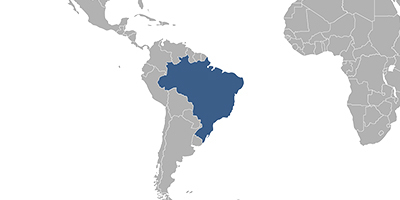 Novelty grace period in Brazil is 180 days preceding the filing date or priority date if any. No official grant fee is required to be paid. The design patent in Brazil is valid for ten years from the filing date, provided that the maintenance fee is paid within the fifth year of a design protection term. The maintenance fee may also be paid within 180 days after such term upon payment of a surcharge. The design holder may renew the term of protection for three periods of 5 years each, up to a total term of 25 years from the date of filing. The renewal of a registered industrial design shall be done by a request, provided that the renewal fee will be paid within the last year of protection period. Late payment of the renewal fee is possible within 180 days after the expiration of the deadline upon payment a surcharge. To perform the industrial design registration in Brazil, foreign applicants should appoint an agent, a registered Brazilian patent attorney. Online Database for Brazilian Designs Search.